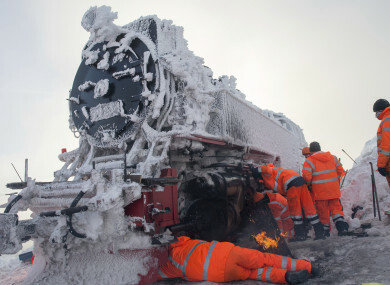 Workers de-ice parts on a classic steam locomotive in Germany. HEAVY SNOWFALL IN parts of mainland Europe has led to serious disruptions and a number of deaths across different countries, with several places cut off and the bad weather expected to persist. Snow in parts of Austria and southern Germany has been causing widespread issues in recent days. There have also been problems in other parts of Europe, even in Norway’s Arctic Svalbard archipelago. In neighboring Slovakia, the mountain rescue service said a 37-year-old man was killed by an avalanche in the Mala Fatra mountains. A 7-year-old child was killed in Aying, near Munich, by a falling tree. German news agency dpa reported that police believe the tree was weighed down by snow. The situation in Germany and Austria was somewhat calmer today than it had been previously. In Sweden a heavy snowstorm has made roads impassable in the north. There has also been heavy snow in the Balkans, which has closed down schools, left some remote villages cut off and disrupted traffic and power supplies in many areas in the region. As well as this, Greece has also experienced rare snowfall, with temperatures plunging as low as -23 degrees in some areas. Several railway lines in the Alps were closed yesterday because of the snow, trucks and cars got stuck for hours on a highway in southwestern Germany and schools were closed in parts of Bavaria. Roads into several places were closed – although Galtur in western Austria, where a massive avalanche in 1999 killed 31 people, was reachable again yesterday after being cut off. The Austrian minister responsible for tourism, Elisabeth Koestinger, said that “in most skiing areas, there is no reason for concern at present if people keep to the rules and don’t leave the secured slopes”. In the Czech Republic, around 9,000 households were without electricity yesterday after heavy snow in regions bordering Germany and Austria. On Norway’s Arctic Svalbard islands, more than 100 people were evacuated as a precaution because of a storm and the risk of avalanches. The Svalbard archipelago is 800 kilometers (500 miles) north of Norway’s mainland. Email “Heavy snowfall engulfs parts of Europe with several deaths and widespread disruption”. Feedback on “Heavy snowfall engulfs parts of Europe with several deaths and widespread disruption”.